The funding needed to reach break-even is the amount of investment a business utilizes to finance the initial losses incurred during the startup phase. This is in addition to funding which might be needed to invest in assets such as inventory and equipment. Most new businesses go through a fairly predictable startup phase. Initially, the expenses exceed revenue and losses are incurred, as the revenue increases the business reaches a break-even point where revenue is equal to expenses and the profit is zero, finally the revenue exceeds the expenses and the business becomes profitable. During the initial phase, when losses are incurred, the equity base of the business is eroded, and investment funding is needed to compensate for this. The level of funding needed to reach break-even will ultimately depend on the rate at which the business is making losses during its start-up phase, and the time it takes to reach the break-even point. The funding needed to reach break-even is best explained and demonstrated using the diagram below which shows the run rate for both the revenue and expenses of the business as they develop over time. In this example, the revenue and expenses increase uniformly as the business grows. The diagram shows that the business moves through three stages. Initially the expenses are greater than the revenue and the business makes a loss. At some stage (in this case 3 years), the revenue and expenses lines cross, at this point, the revenue is equal to the expenses, the profit is zero, and the business is said to break even. Finally, beyond break-even, the revenue is greater than the expenses, and the business makes a profit. The following points should be noted when reviewing the diagrams. 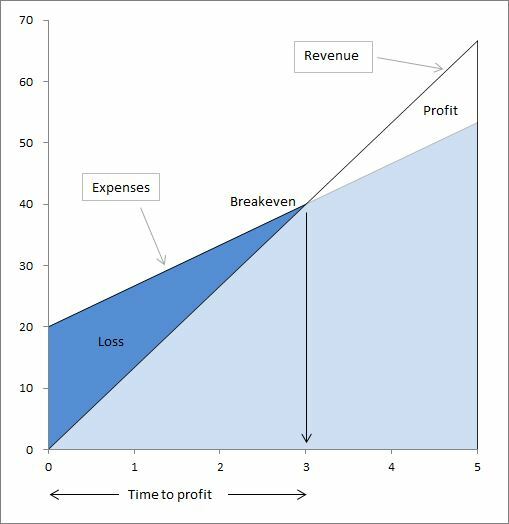 The height of the gap between the revenue and expenses lines represents the profit or loss the business makes at that point in time. The larger the gap, the larger the profit or loss. 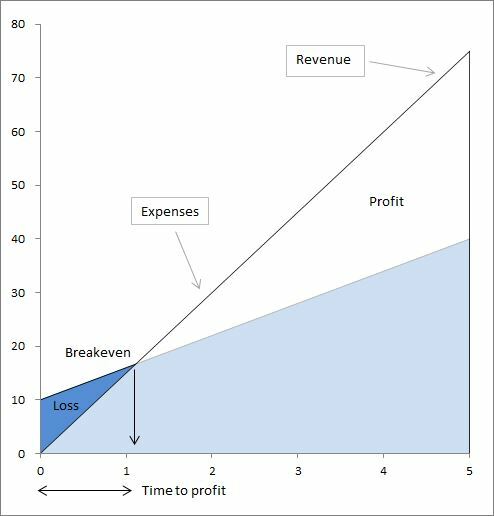 The break-even point at which the revenue and expenses are the same occurs at a point referred to as the time to profit. In this example, it takes three years for the business to reach break-even and the time to profit is, therefore three years. The time to profit is important to investors as it determines the total losses which must be funded by their investment. In the diagram the total losses and therefore the total investment required to fund the losses is represented by the area between the revenue and expense lines, shown shaded in dark blue. The larger the dark blue area, the larger the cumulative losses, and the larger the funding needed to break-even. Ultimately the business moves to a point beyond break-even where the revenue is greater than the expenses and the business is profitable. At this point further investment is no longer needed to fund losses (although it might be needed to fund capital investment). The diagrams can be used to quickly compare and assess the funding requirements to reach break-even for different businesses. 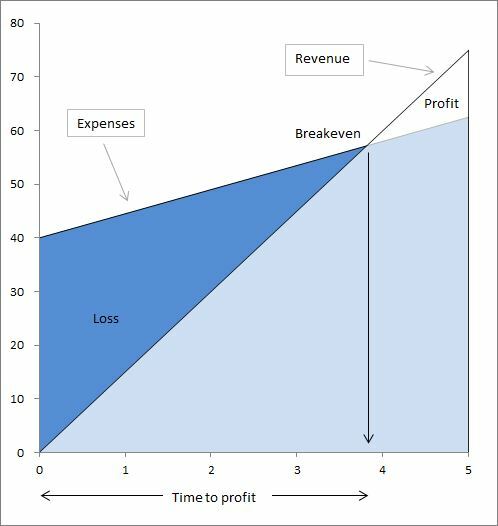 The diagram shows an example of a business where expenses are low in relation to revenue resulting in a low break-even point and a short time to profit. As a result of this, the funding needed to reach break-even, shown by the dark blue shaded area, is low. In this example, the initial startup expenses are high in relation to revenue resulting in a high break-even point. The time to profit is increased and therefore the funding needed to reach break-even (again shown by the dark blue shaded area) is increased. This profile is typical of a tech startup business which requires a substantial investment before revenue is generated.